This week the winds have pretty much been out of the south to south east. Not as bad as last week, around 10-15mph. The water temp this week has gone as high as 90deg so summer time patterns are here. Fish the outside grass lines in the morning, and you better start early. Then by 8:00 move in and throw Senkos and fish slow. 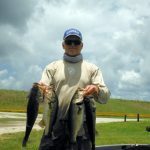 The water has come up about a foot, you can check water level at www.okeechobeejust4bass.com.